2016 has been a trying year for peanut farmers across the state. During the first stop of the day on the 2016 Georgia Peanut Tour, attendees were able to hear and see some of the hardships Georgia farmers are facing. Armond Morris, Georgia Peanut Commission chairman had his equipment hooked and up and ready to dig peanuts when the tour arrived at his farm in Irwin County, Ga. Morris’ farm stop sits on the boundary line of Irwin and Berrien counties off of Highway 158. Morris is a long-time farmer who plants a crop rotation of cotton, peanuts and wheat. He usually grows corn, too, but has elected to only grow cotton and peanuts this growing season. 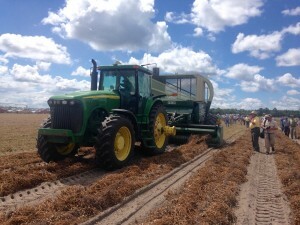 Peanuts being harvested at the farm of GPC chairman, Armord Morris in Irwin Co., Ga.
All of Morris’ crops are strip-till. Peanuts grown on his farm are Georgia 06s, which is the primary peanut grown in Georgia. “It is a great peanut. I think it’s a great peanut for the industry as far as manufacturing is concerned. It’s a very tasty peanut and it makes good peanut butter and roasted nuts,” states Morris. The peanut tour participants were able to see March 26 planted peanuts being picked that did not receive any rainfall from the end of June through the month of July. The peanuts on Morris’ farm have been sprayed with four applications of white mold treatment and then sprayed with 7-20 six times. It has been a hot summer in South Georgia and farmers faced the struggle of keeping enough water to keep their peanuts growing. Morris stated it was important they stayed with this application program due to the exceedingly dry weather conditions. He went on to state that there will be some dry land peanuts in this area that will have a lot of disease issues that could result in Seg. 2 or Seg. 3 peanuts. The GPC chairman thanked participants for attending the tour. Morris stated he hopes after the tour is over, attendees will better understand what the Georgia Peanut Commission means to the whole peanut industry and the whole United States as far as production of peanuts.